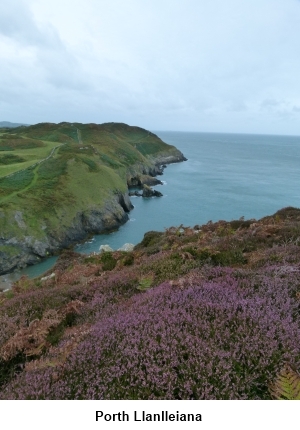 Introduction: This walk follows the coast from Cemaes Bay to Porth Wen. 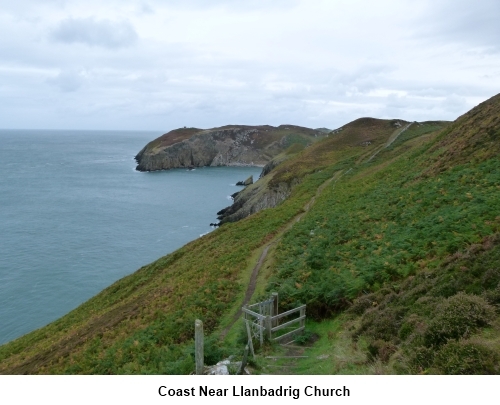 The coastal walking is pleasant enough in itself but it is also a very interesting walk in that it passes the unusual St. Patrick’s Church at Llanbadrig and the derelict remains of an old brickworks with some fascinating structures. 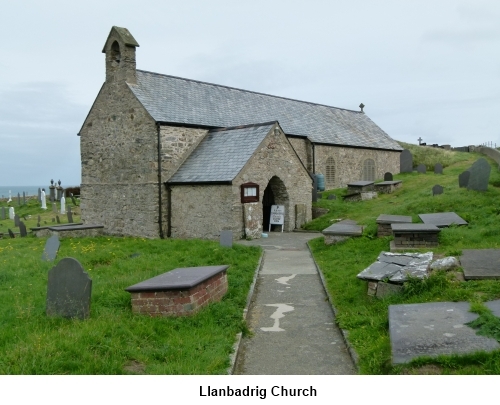 St. Patrick’s Church at Llanbadrig is in a dramatic cliff top setting. 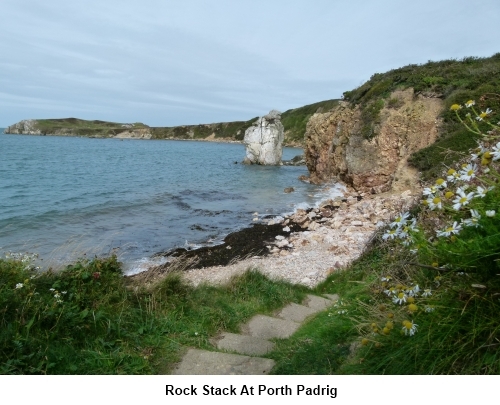 The story goes that St. Patrick survived a shipwreck to come ashore here and took shelter in a cave where there happened to be fresh water. To give thanks, he founded the church here about 440AD. The current stone church replaced the original in 1440 and a major restoration took place in 1884. This was funded by Henry Stanley, 3rd Baron of Alderley who had converted to Islam. The stained glass windows therefore have simple geometric designs rather than the traditional scenes from the bible. Unfortunately the church was attacked by vandals/arsonists in the 1980s and therefore had to be restored once more and opened in 1987. 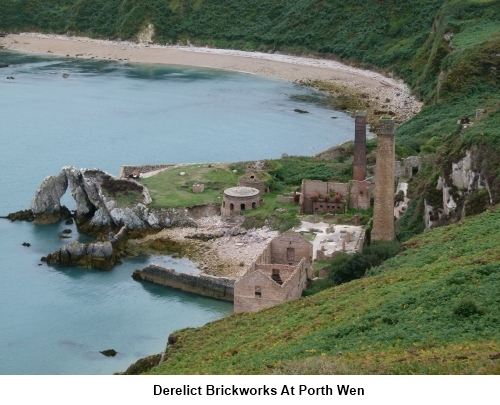 The route continues to Porth Wen where there are the intriguing derelict brickworks. Its speciality was making silica bricks from quartzite. 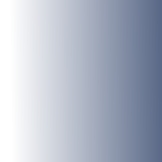 These could withstand very high temperatures and were used in steel making furnaces. Most of the site was constructed in the very early 20th Century. It produced bricks until 1914 when strangely it stopped. It was unused for ten years then staggered on until 1949. Bricks were shipped out from a harbour there. The strange “beehive” buildings with holes are the remains of the brick kilns which were sealed before being fired. 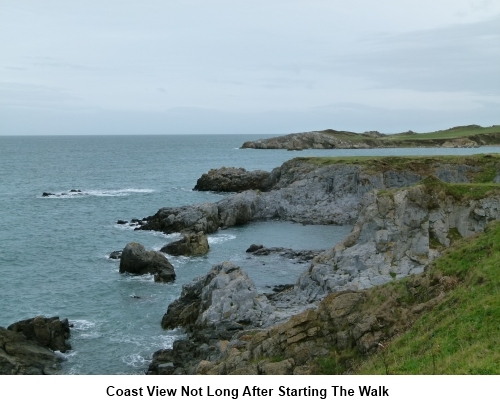 The walk starts from the car park at the north-eastern end of Cemaes Bay. There is another car park at the town end of a very short promenade but as you might expect, this is much busier and you have a better chance of finding a space at the eastern car park. However, you have to walk to the other car park to get a ticket from the little shop (no more than a hundred yards). It is likely to be the largest parking ticket you ever get (size not cost)! 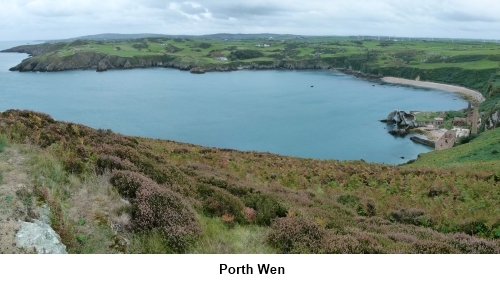 To get to the eastern car park, turn north off the A5025 following a blue ‘P’ parking sign, just after the Cemaes sign and bus lay-by, if coming from the east. 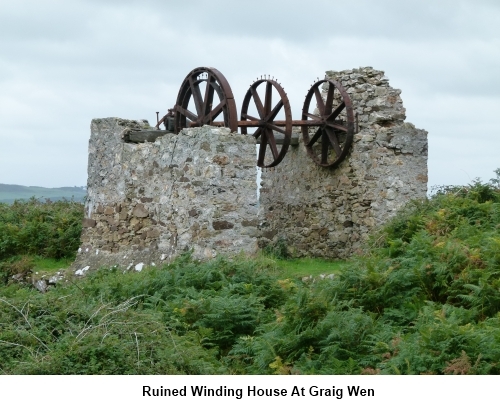 From the west/Cemaes direction, turn left immediately after the sign for The Gadlys Country House Hotel. Follow the road to a ‘T’ junction and turn left. The parking is after about 1/3 of a mile. Start: From the car park, head back along the road for just a few yards. Turn left following a public footpath fingerpost with the blue Anglesey Coast Footpath sign and entering the National Trust property of Penrhyn Mawr. 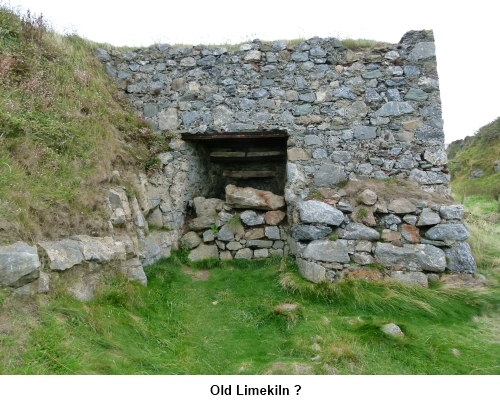 At SH 372941 pass an old lime kiln. 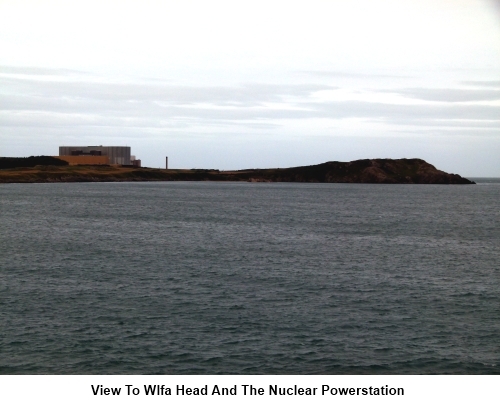 At SH 376944, the path splits and there is a visible sea stack. The route continues along the right hand fork. When the path joins a tarmac lane, turn left (SH 377944). The lane leads to St. Patrick’s Church at Llanbadrig. It is worth a look inside. 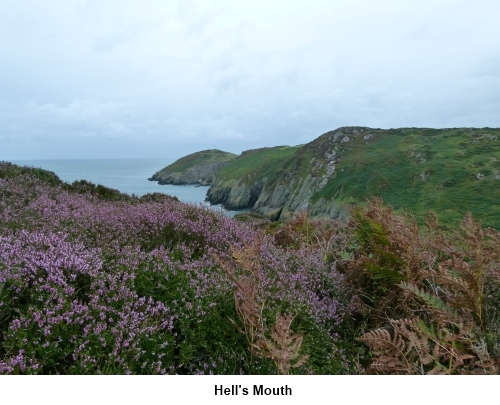 The route then continues clockwise around the outside of its boundary wall and along the cliffs. 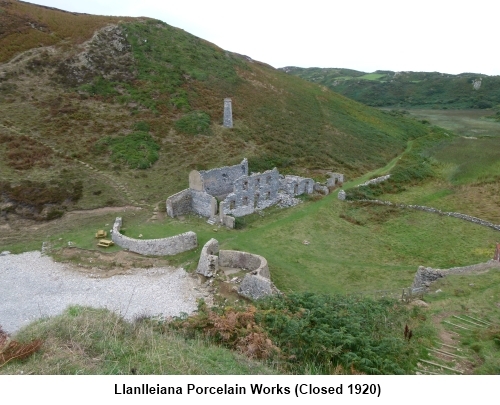 Continue along the coast to Porth LLanlleiana where there are the remains of an old porcelain works and a prominent chimney (SH 388951). There are some picnic tables here too. You come to a broad grassy area (SH 397948), in sight of a mast on the promontory. The path goes across the middle of this field, passing a derelict building at SH 400948 with the remains of the old cable winding. 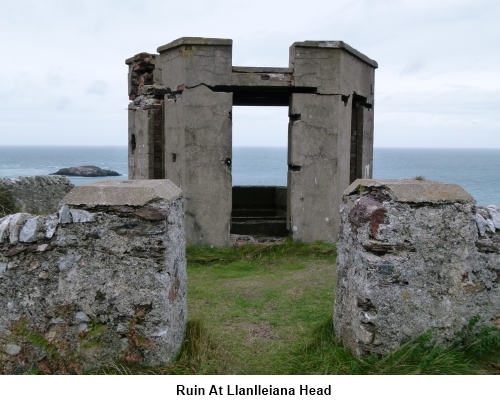 Around two hundred and fifty yards beyond the derelict building, it is well worth taking a short diversion to the mast at SH 402949 because there is a great view from here of the old brick works at Porth Wen. Return to the main path and continue as it arcs right. Should you wish to take a closer look at the derelict brick works, there is a path down to it at SH 401946. It is somewhat overgrown and you go through a five bar gate. However, please be warned that this is a somewhat dangerous place with sheer, unprotected drops and what look like unstable buildings. It is also privateproperty although it was obvious from the path that plenty of people do take a look. It is interesting though! Continue the route along the path as it curves away from the bay. It leads to a narrow tarmac lane where you turn right (SH 399943). Walk along the lane for about a mile, then turn off left to follow a fingerpost (SH 384945), just after a track to “LLanlleiana”. Follow the path to the visible farm, crossing its access track and through the gate opposite. Follow the field boundary on the left. After the next gateway, switch to following the right hand boundary. There was a rough sign indicating the way when I did the walk but this may not last! The path joins a road you probably used to get to the parking. Turn right and left at the ‘T’ junction to return to the car park.